In an attempt to motivate myself to get back in shape, I signed up for a 5K race which is equal to 3.1 miles. I had no idea how fun this accomplishment was going to be and strongly encourage you to try it. I decided about two months ago to run this race and I committed to run three times a week. I started off only running a mile at a time, and worked myself up to the full 3.1 miles. I charted how many miles I ran so I could look back and see how well I was doing and how much I was improving. I also got some great music for my Mp3 player to keep me from getting bored during the runs. Boredom is my greatest obstacle with running, however, frequently changing my music kept me from getting too bored. Running has been great for my mental health and my physical health. I have more energy, patience, and room in my jeans since I’ve started running again. As parents, it’s very important for us to set good examples of physical activity and exercise for our children. It made me happy that my children were at an event that was focused on physical activity and hope that I will model the importance of exercise to them as they grow older. Running a 5K race is a goal that is very attainable for most people. 3.1 miles may sound like a long distance to a person who hasn’t laced up their running shoes in a while (or ever), but it is not as hard to work your way up to it as you may think. I was surprised to see the wide variety of people running the 5K race. I was expecting everyone (except myself) to be in perfect shape. There obviously were a lot of seasoned runners, but there was also many people of all shapes and sizes. There were children running the race with their parents, moms AND dads pushing their younger children in joggers, one man who was pushed in his wheelchair by some friends, and another man who ran with an artificial leg. I was overwhelmed by knowing the sense of accomplishment so many of us had by running that race and proud of every single person on the course! If you want to try a 5K race (or 10K, half-marathon, or marathon! ), you can google running events in your area. If you are having a hard time finding an event, head over to your local running store or gym and ask if they have a list of running events in your area. I found my event through this site. Recruit some friends to run it with you. This will keep you motivated and any experience is more fun with someone to share it with you! Sign up early for the race! Most races do not offer refunds if you end up not showing up. By paying early, you will be less likely to flake out. Practice off the treadmill before the race. It is a little more difficult to set your pace when your running off the treadmill. Next time, I will make sure to practice pacing myself before race day! Bring an extra ponytail holder. During my practice runs, my ponytail holders had a habit of breaking and I would have to stop to try to tie a knot in the ponytail holder so I could tie my hair back. For the race, I stuck an extra ponytail holder around my wrist just in case I had my ponytail holder snap during my run. It’s ok to walk. I stopped to drink my water, and I think just that five seconds of drinking my water revived me for the remainder of the race! Find a good (free) training schedule online. I love Hal Higdon’s 5-K Training Program. Check out the course in person before the day of the race. Our course was advertised as flat, but it was actually hilly in some areas. Set a goal. I set a goal to finish the race in under 30 minutes. When I was able to see the finish line, I knew I had to book it to make my time and I did! I finished my 5K in 29 minutes, 40 seconds and am happy to have met my goal! Reward yourself! After the race, my friends and I headed to Starbucks for some socializing and coffee. Give yourself a major pat on the back, and don’t be afraid to do a little bragging. Not everyone can say they’ve run a 5K, and you deserve to be proud of yourself! I am so jealous of your running! I used to run 5-7 miles a day, but a horrible foot condition (for which I had a surgery in 2006) has slowed me to minimal walks with my son. Oh yeah, and being pregnant again has slowed me even more! I have to have another surgery on my foot after my son is born, but I can’t wait to be able to run again! I guess I will need to get a double jogger and just go for it in order to lose all of this baby weight asap!…Great tips! McKenna, thanks for the very helpful post! That was a fun 5-K! I am going to do the Race For the Cure if anyone wants to do that one with me it’s March 29th. You can also do the walk. I agree with McKenna and highly advise running on the road when training. Even if it’s just 1/2 mile at first. I have shin splints now because I didn’t train on anything but the treadmill! Training on both the treadmill and the road will be helpful. Thanks for the information McKenna. It must be mentioned that Kristi ran it with me and placed second in our category! She finished it in 25 minutes!! Not bad for her first 5K, huh? Kristi, I’ll check with my husband and see if we have anything going on. The downfall to this new addiction is the $20 race fee…but I think it’s a great thing to be added to our family budget. That is awesome Mckenna!! I am so jealous. I hate running. Typically I can only do about 25 mins on the treadmill and that is switching between walking and running. Great for you. Did Heidi run as well? I really miss you guys. Keep up the awesome work. You did great! And you’ve motivated me to get back on that treadmill and on the road again. Now let’s see if my schedule will allow me to do it! Way to go McKenna!!! Hey McKenna! I enjoyed reading about your accomplishment; don’t you feel great?! I took up running 3 years ago, and it’s been the best therapy as a mom and wife. Do I see a 10K in your future?!!! @Sara – no, I didn’t run it (foot injury) so I signed up to walk a separate 1.5 mile SCENIC course to support McKenna. Our course was NOT scenic, and I walked the entire 3.1 mile running course. All the walkers were fooled! 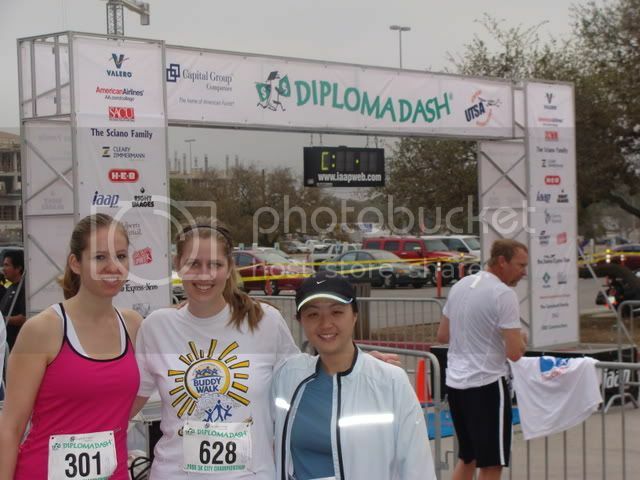 I hope to be injury free soon and run a 10k with McKenna and Kristi at some point. Yes, you girls will run a 10K!!! Congratulations on your first 5K race! I am training for my first 5K race too. The Couch to 5K program cannot be beat! I love it. I am doing something I never thought I could do. Pingback by The Mom Crowd » Episode 4 of The Mom Crowd Show!